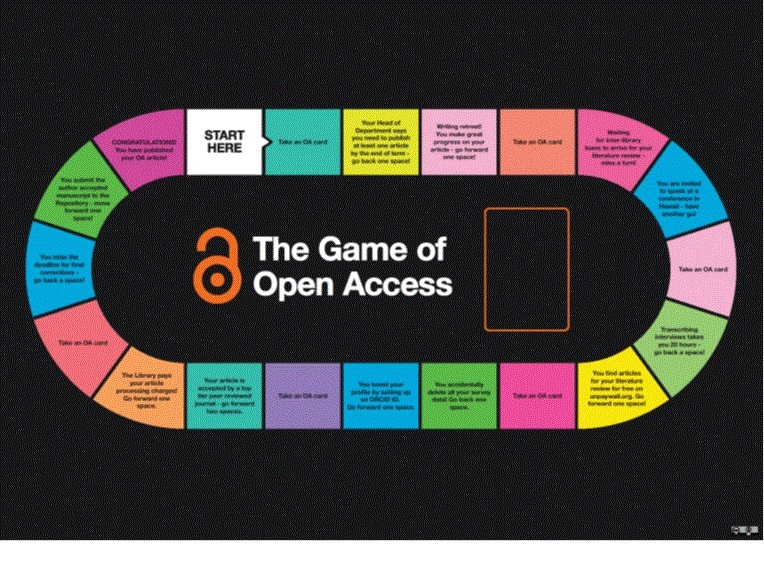 The Game of Open Access is a board game developed by staff from Computing & Library Services (CLS) at the University of Huddersfield in 2017. The aim is to to engage researchers with the key concepts and tools required to meet Open Access mandates. Through the use of playful learning, it aims to develop an understanding of the role of Open Access through the initial idea for an article to its acceptance for publication. The Game normally takes between 10-20 minutes to play, depending on the number of players and how much discussion takes place. The game has been played by researchers and librarians in the context of library roadshows, in Open Access information sessions with PG researchers, at library events (the 2017 UKSG Forum, the CILIP ARGL DARTS6 conference, and the 2018 Repository Fringe), and increasingly by libraries worldwide. We'll be taking it to #ScholComm19 and Icepops 2019 this spring, and discussing it together with other games for researchers at #ARLG19. Researcher at the University of Huddersfield? Would you like to play the Game of Open Access in your research group? Contact your subject librarian and we'll send over a Game set to you. A number of other games are available for early career researchers to learn more about Open Access, research impact and publishing - a collection of links to these can be found at http://wke.lt/w/s/4dJ0w. The Game of Open Access comprises three files: the Game Board, a set of Game cards, and the Rules. The resource can be shared and adapted under CC BY-NC 3.0. This is the March 2018 revision of the Game. Background information on the development of the Game is given in The Game of Open Access - making UK mandates more memorable, a poster presented virtually at the Charleston Conference, November 2018. What do I need to play the Game of Open Access?